Valval is a very popular Konkani dish. Yogi Ratna is its other name. It is a very mild dish and is commonly prepared for special occasions like marriage, thread ceremony etc, as it is a No- onion and garlic dish. I tried it for the first time and we loved it. I served it along with rice and batate vaagu and the combination was a hit. Try making this. This dish has loads of veggies, the richness of the coconut milk and the seasoning using ghee gives it a special touch. Altogether its worth trying. *Vegetables that can be added- Cow pea beans (alsande), potatoes, beans, carrot, yellow cucumber (magge), ivy gourd (tendle), potato, ridge gourd (ghosale), pumpkin (duddi) or any fresh vegetable of your choice. Don't add onions and drumsticks, as they give a very different flavor to the dish. Just add 7-8 types of veggies. **You can as well add the whole cashews. Wash and chop all the vegetables into desired size and shape. Remove the peel of the tender cashew nuts (if using). Now take a vessel and put all the cut veggies, green chilli into it. Add water and salt as required. Close it with a lid and let it cook on a medium flame for 15-20 minutes (check in between). Once all the veggies look cooked, then take all purpose flour in a bowl and add few tea spoon of water. Mix it well to remove all lumps and then add this paste to the cooked veggies. Mix it well for a minute. Now add the coconut milk and keep stirring continuously. Once it comes to a boil, turn off the heat. For Seasoning- Heat ghee. Then add mustard seeds. Once it starts spluttering, add cumin seeds and curry leaves. Fry until cumin seeds turn slight brown. Turn off the heat and add this to veggies in the coconut milk. Mix well. Valval is ready!! Serve it hot with rice and a spicy dish like Batate vaagu, batate song or any other spicy dish of your choice. Cabbage Ambado is a very delicious fritter. I got this recipe from my amma. My amma makes excellent ambados and cannot be matched with any other! It is one of our favorite ambado. This was my 2nd attempt and I was happy with it as it had turned out somewhat similar to my amma's. Soak the rice and chanadal together for 1-2 hours. When it is soaking, chop the cabbage and onion, fry the dry red chilli using few drops of oil. Once the rice and chanadal gets well soaked drain the water completely. Now grind together the soaked rice- chanadal, roasted red chilli, grated coconut, tamarind and salt to get a coarse sticky paste (don't add water while grinding). I hope its clear from the picture. The crushed rice- chanadal grains should not be too coarse or turned to a paste. Making this paste is a very important step. Once the rice mixture is ready, start heating the oil. Check for salt in the rice mixture. If the oil is hot enough then, its time to add the chopped onion- cabbage (this has to be done absolutely at the end because they give out moisture when mixed with rice mixture. If the moisture content in the final mixture is more, then the fritters will absorb more oil. Hence this is another important step) to the rice mixture. 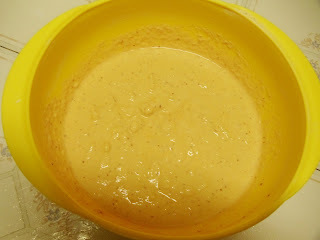 The final mixture just before frying looks like this. Fry them (don't over crowd while frying and the flame should be medium-high) in hot oil until they turn crispy and dark brown on both sides. Once it is done, drain them on a paper towel to remove excess oil. Cabbage Ambado is ready!! Serve it hot with rice and dalitoy. Above measurement makes 14- 15 fritters. Note: These fritters turn out very crispy. If you want it little on the softer side then increase the amount of grated coconut to 2-3 Tbsp. Ambuli Chutney is a very simple recipe. In konkani, ambuli means raw mango. It requires very few ingredients and can be made within 10 minutes. I got this recipe from my amma. Raw mango is one of my favorite. I can eat it with little salt at any time of the day. Few days back when I saw raw mangoes in a shop and got them to make chutney (so that I can post the recipe of the same). It was so good that I finished it off. Hence got it again:-) Try this variation of chutney. *The amount of raw mango depends on the the sourness of the mango as well as how much sour you want. So adjust it accordingly. Remove the hard green skin of the raw mango and dice the white portion. Now grind everything together mentioned under ingredients with little water (nearly 1/4 cup) to a semi coarse paste. Check for the salt, sourness as well as spiciness. If everything is good then transfer it to a bowl. Ambuli Chutney is ready!! Serve it as a side dish to rice. I would suggest you to serve this chutney with rice and a spicy curry like Batate Vaagu, Batate Song or any other curry of your choice. Above measurement serves three people. Gova Kana Paaysu is a very popular paayasam/pudding in South India. In Konkani Govu means wheat (and we call gova kana for broken wheat). It is a healthy and easy dessert. It is commonly made for special occasions, festivals etc. This dessert is a 'No ghee dessert' (so no saturated fats) and hence you feel less guilty even if you gulp down more paayasam:-) Not only that you also get iron from jaggery. So what more reasons do you need to try this traditional paayasam..Make it today and enjoy! Wash the broken/cracked wheat. Transfer it to a dish and add water (level of the water should be well above the cracked wheat, nearly 1-1.5 inches above). Close it with a lid and allow it to cook on a medium flame. Check occasionally to see whether it requires water. After 10-12 minutes the pieces of wheat will double in their size. 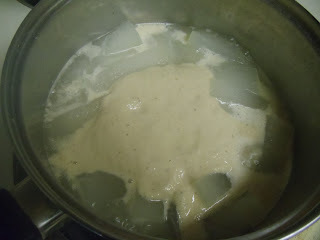 The cooked wheat now looks like a sticky mixture (Add water, if it becomes very thick). Now add jaggery and mix well (Keep stirring continuously). When the jaggery melts completely, add coconut milk. Mix well (consistency of the paayasam/pudding should be medium thick). When it comes to a boil, turn off the heat. Add cardamom powder and mix well. Garnish it with dry fruits, if preferred. Gova Paaysu is ready!! Serve it hot or cold. Above measurement serves three people. 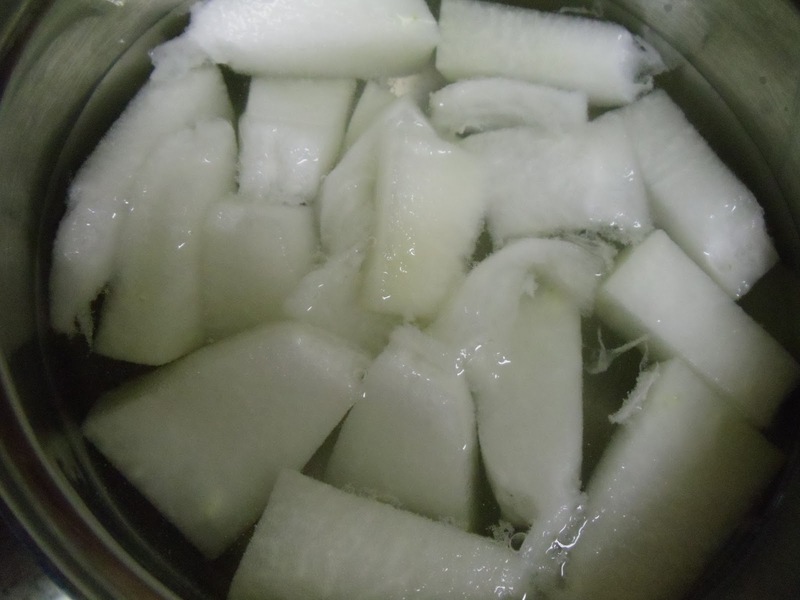 Note: #If you want to make Coconut milk at home, then grind grated coconut along with water to get a fine paste. Then strain it to extract the milk from it. #You can also try substituting regular milk for coconut milk. This dish is commonly made for special occasions like wedding, thread ceremony etc as it is no-garlic and onion dish. I tried making it for the first time and loved the taste (though it was little bit spicy for us). Try making this dish and enjoy! Wash potatoes and tomato. Then chop them into bite size cubes. To prepare Masala: Roast the coriander seeds with few drops of oil until it turns light brown. Allow it to cool. Then grind grated coconut, roasted red chillies along with roasted coriander seeds, to get a fine paste. Add water as required while grinding. Now heat oil in a kadai. Add mustard seeds. Once it starts spluttering, add curry leaves. Then add chopped potatoes. Sprinkle some salt and saute it fro 2-3 minutes on medium flame. Then add chopped tomatoes. Mix it well. Continue frying for two more minutes. Then add the ground masala. Mix it well. Then add water (nearly a cup or adjust accordingly) and check for salt. Close it with a lid. Continue heating until the potatoes get cooked. The final consistency should be thick but not dry. Batate Vaagu is ready!! Serve it hot with rice, roti, dosa. Above measurement serves 2-3 people. Note: #You can try adding little bit of Asafoetida to the masala. #If the dish has turned out spicy then try adding little bit of tamarind. This will balance the spiciness. #You can also cook the potato separately, in a cooker or Microwave. In that case add the potatoes at the end (after the masala comes to a boil). This method saves time. #One of my readers suggested to garnish it with coriander leaves. Bisi Bele Bath is a very popular dish of Bangalore. It is also popular as Sambhar Rice or as BBB! In kannada, Bisi bele bath means hot lentil rice. As in its name, this dish has to be eaten hot. Me and my husband are a big fan of this dish. BBB when made using home made spice powder, is a treat. The fresh ground spices add a great flavor to it. The procedure might look lengthy but the happiness and satisfaction on the face of your loved ones, after eating it makes it worth the effort and make it again and again. My amma makes it often from many years. She noted down this recipe from some book ( I don't know). She gave me a rough measurement (as she eyeballs it) and I have been making it from a year or so and never failed, when it comes to its taste. Try making it from scratch to know the difference! This is a healthy dish as it has proteins from dal and lot of veggies. Altogether it is a complete meal! Wash the rice and Toor dal. Take them in a cooker. Add enough water (the water level should be 1-1.5 inches from the rice-dal mixture). Also add the chopped veggies- carrot and beans, peas (I used frozen beans and peas. hence I didn't cook them in a cooker, as they cook quite fast). Cook them altogether for 2-3 whistles (don't worry if the resulting cooked mixture is mushy). While it is cooking, prepare the masala. To make BBB powder: First dry roast the grated coconut. Fry until it turns light brown. Half way through its frying, add turmeric powder. Transfer it to a plate and let it cool. Now in the same pan, fry all the spices listed under masala, one by one until they turn light brown. Allow them to cool. Blend them together to get a fine powder. BBB powder is ready. Now, heat oil. Add mustard seeds, Once it starts spluttering, add curry leaves and cashews. Fry for few seconds and then add BBB powder. Mix well and add 2 cups of water. Then add chopped beans and peas (if you have not cooked them along with rice- dal mixture). Add salt and close the lid. Let it cook for a while, say 3-4 minutes. Then add the cooked rice- dal- veggie mixture and mix well. Add enough water. Then add tamarind pulp and check for salt. Close it with a lid and bring it to a boil. Adjust the consistency of the BBB, once it comes to a boil (I like it little watery. You can as well serve it thick. But remember that BBB will become thick as it cools down). Turn off the heat. Bisi Bele Bath is ready!! Above measurement serves four people. Note: Some people as well add capsicum, potato, cauliflower, potato etc while making BBB. But I personally prefer carrot, beans and peas. So add veggies of your choice. Benda Sagle is one more popular konkani dish. Byanda means lady's finger in konkani. I got this recipe from my amma. She makes it regularly. I tried it for the first time and it turned out tasty. Try making this dish and enjoy!! Wash the lady's finger/okra and pat dry using a cloth/paper towel. 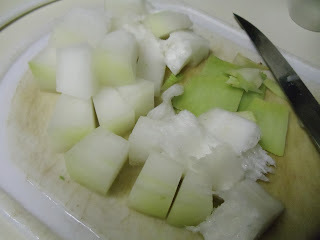 Then cut them lengthwise (edges trimmed) into 1-1.5cm long. For the masala: Roast coriander seeds and methi separately in few drops of oil, until they turn light brown. Allow them to cool. Then grind the roasted spices along with grated coconut, red chillies and tamarind. Add water as required. Then transfer this masala into a dish and start heating it on a medium flame. Add the cut okra to the masala. Mix it well. Add salt and water, as required (don't add too much of water at a time. Add as and then). Close it with a lid. Continue cooking until the okra looks cooked (it might take 10-15 minutes). The final consistency of the dish should be medium thick. So adjust it accordingly. For seasoning: Heat oil. Add mustard seeds. Once it starts spluttering, add curry leaves and turn off the heat. Add this to the prepared curry and mix well. Benda Sagle is ready!! Serve it hot with rice or idli, rotis. Above measurement serves two people. Kadge Uppata is a simple konkani dish. I made it for the first time and liked the different taste of it. Why is it so different?..it is because the dish is raw (only the jack fruit is cooked). The masala added has a unique taste. I got this recipe from Jaya V Shenoy's book and made slight variation. Try making it. Drain the liquid from the tin and wash the jackfruit pieces (if using fresh, then remove the outer hard cover with greased hands). Cut it into pieces. Now pressure cook the jackfruit, adding 1- 1 1/2 cups of water and salt, for 1-2 whistles. Allow it to cool. For masala: Roast 1/2 tsp of mustard seeds along with methi seeds adding little oil, until they turn slight brown. Then add asafoetida and turn off the heat. Allow it to cool. Now grind grated coconut along with red chillies, tamarind and the roasted spices to get a smooth paste. Add water as required. Now add this masala to the cooked jack fruit and mix well (For this dish, there is no need to cook the masala). Adjust the consistency to medium thick. For seasoning: Heat oil and then add the remaining 1/2 tsp of mustard seeds. Once it starts spluttering, add curry leaves and turn off the heat. Add this to the prepared curry. Mix it well. Kadge Uppata is ready!! Serve it along with rice. Above measurement serves 2-3 people. Note: Try to finish this dish on the same day. This is because it is not served hot and hence if you store it in fridge, then you cannot heat it. Even if you heat it, it doesn't taste good. Vegetable Upma is a very simple and healthy breakfast. This is one of the breakfast which is not liked by many (even I was one of those). If made with right ingredients, then anything can be made tasty! This particular recipe has that taste which will impress most of them. This Upma has that extra richness from ghee, nutrients from vegetables and a different flavor induced by the ginger. Try making this way and I am sure you will not say "No" to Upma, here onwards! *Vegetables I used- onion, carrot, peas ( I used frozen) and beans (I used frozen). You can also add potato and any other vegetable of your choice. Dry roast the rava in a skillet for 3-4 minutes. Transfer it to a plate. Now Cut the vegetables into very small pieces. Then heat the mixture of oil and ghee. Then add mustard seeds. Once it splutters, add cumin seeds. Then add chana dal, urad dal, cashews (if adding), chopped green chillies, grated ginger and curry leaves. Fry until they turn slight brown. Now add chopped onion and carrot. Mix well. Add salt. Fry for 3-4 minutes. Then add rest of the vegetables. Fry them until they are half done. Then add water (I added 1 3/4- 2 cups). Close it with a lid. Let the water come to a boil. Once the veggies look cooked, check for salt (you have to check it now itself. it is not possible to add salt once the rava is added). Now slowly add rava and keep stirring it continuously with the other hand. Once the water is absorbed completely, add chopped coriander leaves and close the lid for a minute on a low flame. Then turn off the heat. Vegetable Upma is ready! Tingalavre Song is another favorite dish of Konkanis. "Song" in general, is a very spicy dish. It can be made with or without coconut. The following recipe is without coconut. I got this recipe from my husband. In one of my earlier posts, I had posted Bibbe Song. The basic ingredients for both the recipes is almost same. Just that instead of mustard, garlic is used here. Addition of garlic gives it a different twist. Try this variation and enjoy! *You can as well use black eye peas or kidney beans instead of white beans. 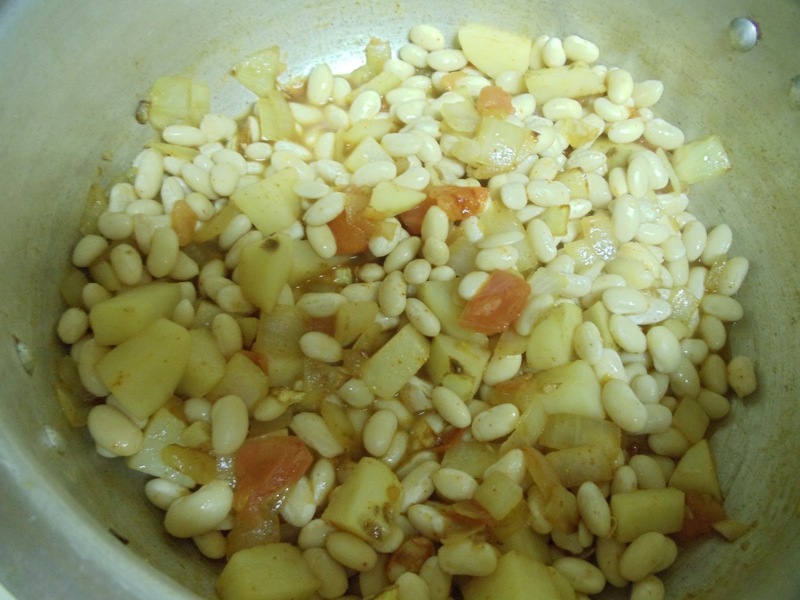 Now chop onion, potato and tomato into desired shape and size (white beans requires more time to cook. So I made it in a cooker). Heat oil in a cooker. 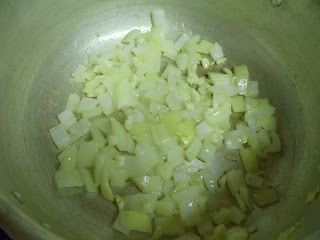 Once it gets heated, add chopped onions and chopped garlic. Fry for 3-4 minutes on a medium flame. Now add chopped potatoes. Continue frying for 2-3 minutes. Then add chopped tomato. Mix it well. Now add red chilli powder and salt. Mix it well. 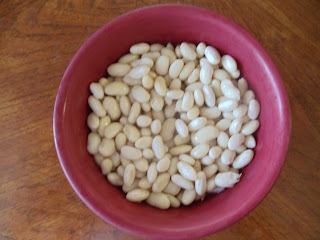 Finally add drained white beans. Add water as required (Nearly 1-2 cups). Close the lid of the cooker and cook it until the whistle blows 3 times (by this time the potatoes will get over cooked. Don't worry. This gives thickness to the curry. I made the curry thick. You can adjust the thickness after opening the lid. If adding water/want to remove water, bring it a boil for few minutes. If the curry has become very spicy, then you can add little bit of tamarind pulp). Tingalavre Song is ready!! Keerla Polo is a very tasty dosa. I got this recipe from my amma. She makes it once in a while. In konkani, keerlu means bamboo shoots. 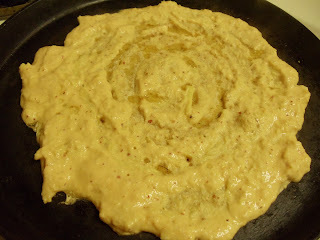 In one of my older posts, I had posted Keerla Podi (fritters). The ingredients to make both of them is almost similar. Just that one is shallow fried and the other deep fried. Try making these dosas and enjoy yet another variety of dosa. Soak rice for two hours. Drain the water and grind it along with red chillies, to get a smooth paste. Add water just enough to aid grinding. 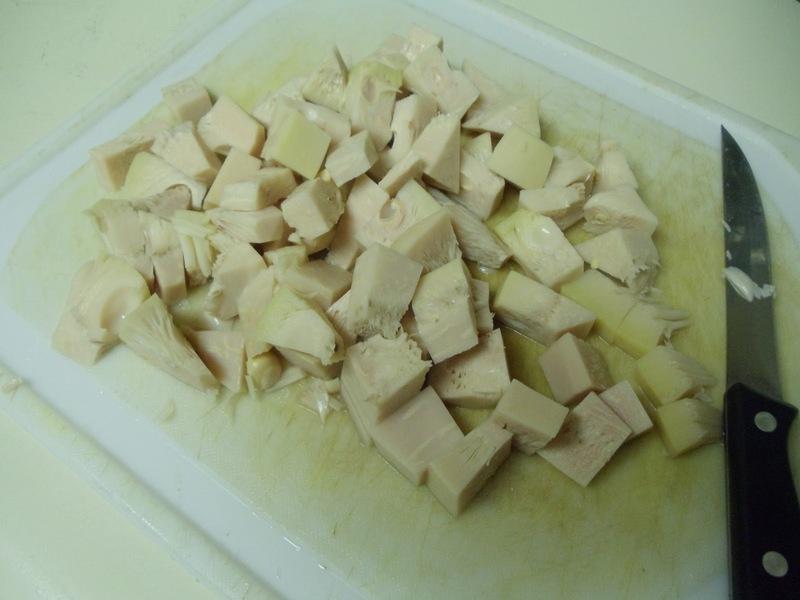 Then finally add the bamboo shoots to the rice paste and crush them coarsely, by giving few pulses. Transfer the paste to a bowl and add salt. Mix well. Adjust the consistency to medium thick by adding water (batter should be similar to a normal dosa batter). Now add a ladel full of mixture on a hot pan and start spreading it as thin as possible (you can as well make thick dosas). Add little oil over the dosa and close the lid for a minute (let the heat be on medium). When the base of the dosa turns golden brown, flip it to cook the other side of the dosa. Once it turns brown on the other side, remove it from the pan. Keerla Polo is ready!! Serve it hot, as a side dish to rice. Above measurement serves 2-3 people. Note: I saved 1-2 pieces of bamboo shoots and instead of grinding it along with rice, I just crushed it using a stone. The crushed pieces were then added to the batter. By adding these pieces, the process of spreading the dosa will become little difficult. But this step is purely optional.